- Identify scientifically validated Positive Precogs through the largest global online scientific experiment of its kind. - Track the performance of Positive Precogs who have ever been admitted to the Hall of Fame with a view to creating a Positive Precog Council to advise on matters of global significance as well as a Positive Precog consultancy service to advise businesses, governments, schools and individuals on their futures. - Replace the Randi Challenge with the Premonition Code Challenge: If you get 80% correct or higher performance after 100 individual tests on the website, you will receive a wall plaque with your name engraved on it in commemoration of your efforts, invitations to participate in additional scientific experiments, and permanent listing on the Positive Precog Hall of Fame, along with your contact information and website details. 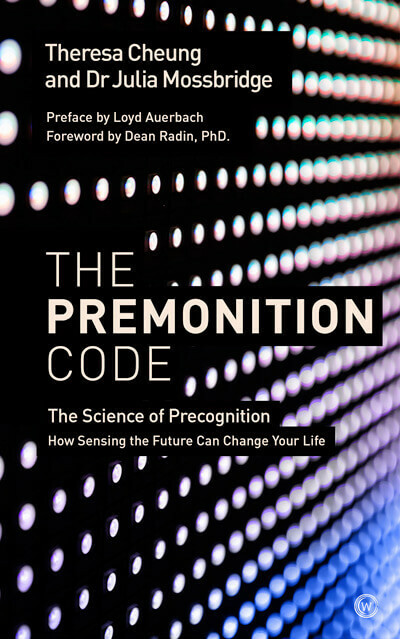 - Encourage those who aren’t identified as Hall-of-Famers to continue to embrace the idea of the potential within them and work towards more accurate precognition performance, as practicing Positive Precogs. - Provide a platform to access further precognitive training and insights from both Theresa Cheung and Dr. Julia Mossbridge, including a free newsletter and community forum, links to relevant videos, news items, and research, and paid online Positive Precog 101, 102, and 103 courses. - Unite people regardless of culture, religion and gender in a global quest to not just see but also create a better future for themselves and the planet.